One of the great things about growing up around a bunch of farm women is the endless exposure to tips and tricks that are often left out of recipes. One of the worst things about trying to emulate said women is they don’t always feel the tips and tricks are worth noting in a recipe. It’s not always intentional … wink, wink. 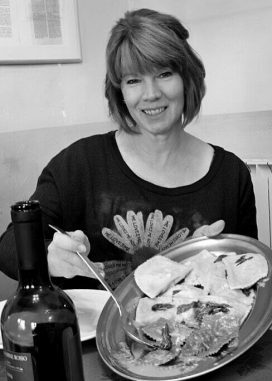 Did you ever see the episode of “Everybody Loves Raymond” where Ray’s wife, Debra, gets a recipe from Ray’s mom, Marie? And Debra follows this recipe over and over and cannot make the dish taste anything close to Marie’s? She finally discovers that Marie has changed the label on a spice jar to protect the secret ingredient and thus preserve her family’s respect for her cooking skills. My ham and bean soup recipe involves an unintentional omission. The best part is, it was a recipe from my mom! 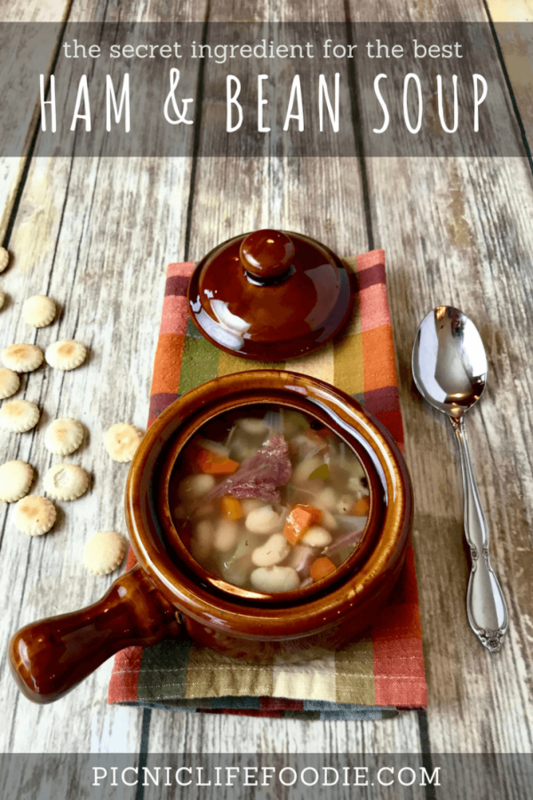 When she would cook a bone-in ham for our family, she would turn the leftovers into the most incredible and satisfying ham and bean soup. The beans were perfectly cooked. Little chunks of ham were swimming around the broth with the carrots, onions and celery. Every bite was … well, I’m getting carried away into fantasy-land here but it really was that good! So when I started making ham dinners for my family, I was anxious to duplicate her soup. She gave me the recipe and I made it and was so excited to share it. I took my first spoonful and thought … “Wait a minute! This isn’t even close!” How could I have possibly screwed up such a simple recipe? Was it the ham I used? Why was the broth so …weak!?! And here is where the “unexpected ingredient” which I mentioned in my previous post comes into play. I was with my mom some time later when she was making ham and bean soup. I was watching her every move … how she cut things, the order she added them, the expression on her face as she put it together. I was in full-on student-following-master mode! She went to the refrigerator and pulled out an apple. 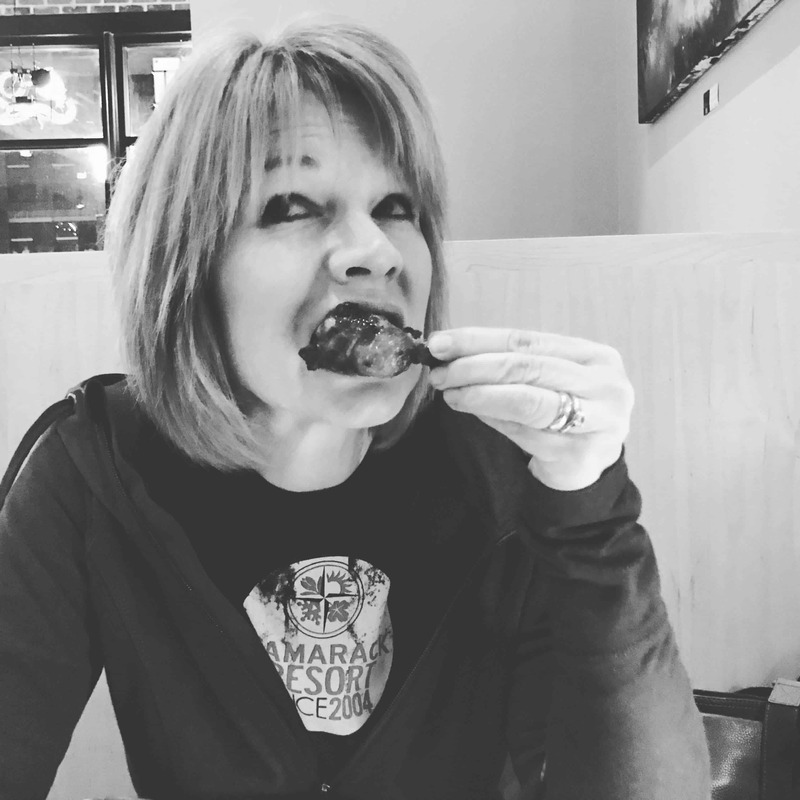 So she needed a snack. Ok, I can wait. But no … she cut it into quarters, removed the core and dropped those four pieces of apple right into the pot! Shrug. How much difference could one apple make? Yep … that was the crucial ingredient. It completely changed the flavor of the broth. One. Apple. Since then I have made wonderful ham and bean soup. Occasionally I rush the cooking of the beans and they end up a little tough (see tip below), but the broth is spot-on when I include the amazing apple. 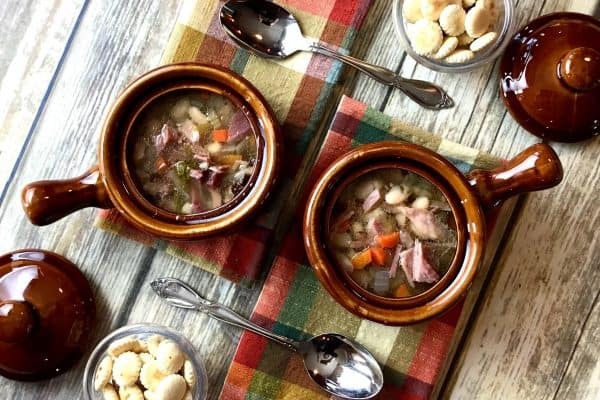 Salty ham, creamy white beans, colorful veggies combine to form the cast this hearty soup. It is, however, the apple that is the director of this show ... the one that makes sure everyone else gets the credit while quietly balancing out the whole performance. An exaggeration? Not if you have ever made this soup without the star. In a large stock pot, combine first four ingredients and one bay leaf. If there isn't much meat left on the bone, add a few more pieces from the leftovers (enough to end up with about 2 cups of diced ham pieces). Bring to a boil; reduce heat and simmer 60-90 minutes or until beans are tender (see note below). While the ham and beans cook, the apple will disintegrate, leaving only the peel. When beans are tender, remove from heat and discard apple peels. 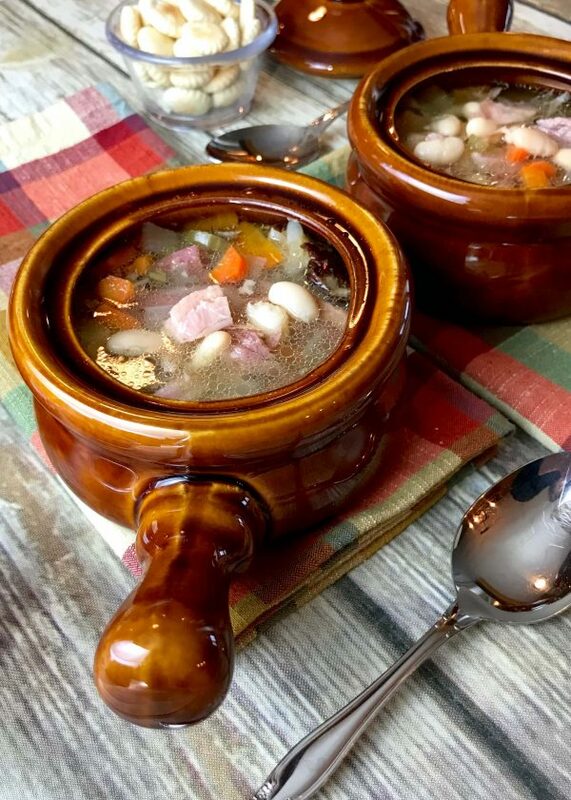 Remove ham pieces and bone from soup. When cool enough to handle, pull ham off of bone. Shred or cut ham chunks into bite-sized pieces and return, along with the bone, to the soup. In a second pan, combine second bay leaf, carrots, celery, onion, bay leaf, salt, pepper and just enough water to cover the vegetables. Bring to a boil; simmer 15-20 minutes or until carrots are tender. Add vegetables and the broth to the stock pot. Allow to cool and refrigerate overnight. Remove bay leaves before serving. Ham Note: As mentioned in the post, this recipe is written for the wonderful leftovers and "scraps" from cooking a bone-in ham. A center-cut ham steak (with bone) can be substituted for the ham bone. Look for one that is at least one pound. 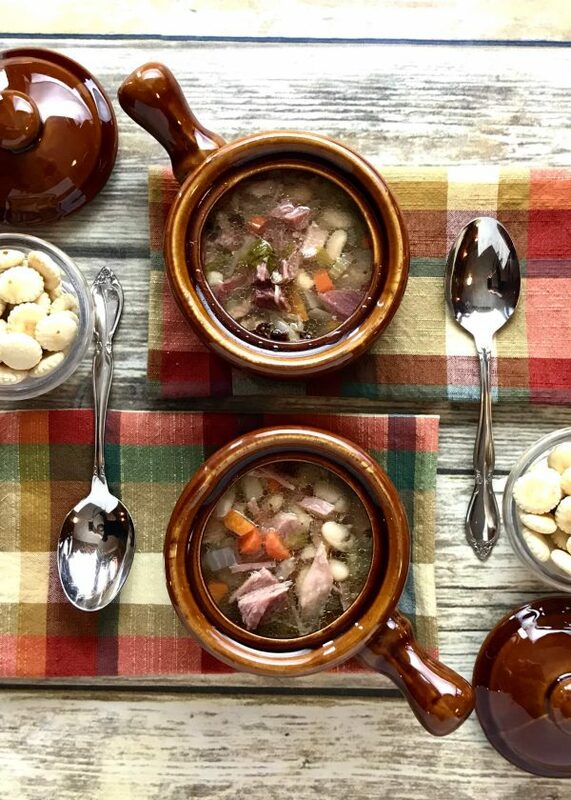 TIP: Soup tastes better when it has rested for at least one day. This is a must for this soup. TIP: When you test the beans to make sure they are tender, test more than one. Some will cook a little faster than others. I know my mom is blushing a little as she reads this. After all, it wasn’t like she purposefully sabotaged the recipe just to make sure her soup was always better than mine. She doesn’t have a dishonest bone in her body and she likes nothing better than to see other people happy. Maybe she was just insuring I would always come home to share a bowl of soup with her.